When I was a preschool teacher, we wanted to improve our school play yard to be more developmentally appropriate and natural. The only equipment that was allowed to be purchased and installed had to first be approved by the school’s insurance company and installed by a million dollar bonded contractor. Needless to say, our $30,000 amounted to to very little that was natural, and the commercial play structure was small and disappointing. The risk of being sued for injuries has caused many schools and playgrounds to remove the element of nature in exchange for plastic and metal structures with eight inches of cushioning below. Fortunately in Canada, there is a movement afoot to bring back nature and its inherent risks to play. At first, parents fretted about the rocky hillside. It screamed danger to some who gathered at a town hall about Lord Selkirk School’s new playground plans three and a half years ago. What if the children were running over the hill, didn’t see the rocks and tumbled down, scraping their knees and elbows or worse? 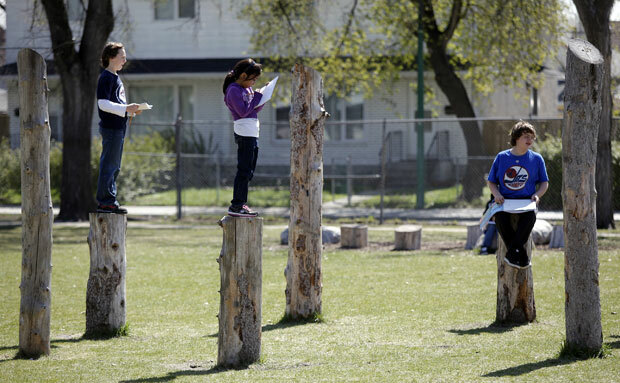 Stormie Duchnycz, principal of the Winnipeg school, and the landscape designer who was working on the plans carefully explained its hidden virtues: The rocky hill would help expose their children to nature, it would be physically challenging and engage the whole of their little bodies. Kids would be aware of their surroundings, but their imaginations would also run wild as they incorporate the rocks into their play. I love this idea of a “nature-oriented playground featuring rough materials” such as logs and rocks! It is much cheaper than commercial playground equipment and inspires children to play. Their imagination, even for older children, is not bound by a structure that dictates the kind of play or how it is to be used. No one is telling a child what to pretend to be when standing on a log, besides it is a pleasant place to hang out and socialize. The international alliance has introduced lots of ideas for how to re-introduce risk, many of the more tangible ones from parks and schoolyards in Berlin, Germany: a rough hewn bridge that introduces kids to natural textures, a tensioned, spider web-like play structure that helps them problem solve and develop a sense of balance, a boulder wall made of natural stone that kids can climb and jump off of. Logs, stumps, rocks, sand, mud, water, etc. These are all things that are good for kids! We joke that our playground is going to qualify as wet lands soon. After an incident earlier this week, my class and I had a discussion about how we treat animals – specifically wild animals.